Conflict, many would argue, is intrinsic to the relational nature of humanity and as such is a vital topic for philosophical thinking. From the Indian epic of the Mahabharata and St Augustine’s concept of the ‘just war’ in Contra Faustum Manichaeum the philosophical interest in war and conflict has been a fixture of the canon. However, given the rapid escalation of the involvement of technology in conflict as well as the increased awareness of the psychological toll of warfare, this requires a new kind of philosophical engagement. 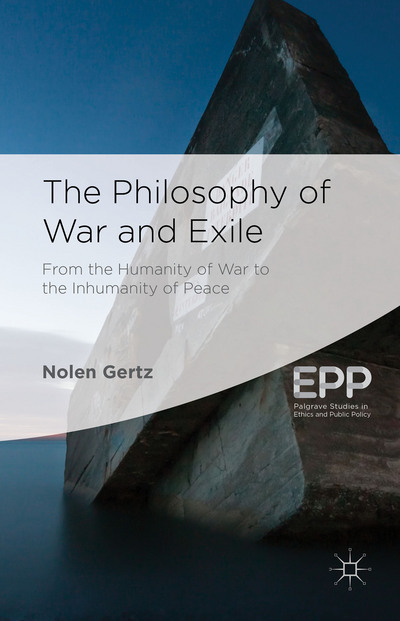 It is from this new requirement that Gertz’s invaluable book emerges, tracing the holes and flaws in commonly held philosophical approaches to not just war, but also crucially, the human cost of war and trauma. Opening with a clear and somewhat shocking thought experiment, the text adroitly draws out the common patterns in the response to combatant’s traumatic experiences and neatly highlights how the often-sincere desire to know just what to do for them can fall painfully short. The book seeks to ask whether it is possible that our current actions, performed under the guise of “supporting the troops” are in fact obstructing our understanding of combatant’s situations, and if so, what the appropriate philosophical response might be. In terms of the medicalisation of traumatised soldiers, whilst we are ‘very proficient at treating and naming “symptoms”, this in no way means that ‘we are proficient at properly understanding and judging the meaning of these symptoms.’ (6) Despite the undeniable sophistication and advancement in the means of waging war, our understanding of military suffering has remained remarkable ‘consistent’ (4) and it is this consistency that the book sets out to challenge through a close philosophical critique of PTSD and just war theory as well as revealing empirical insights into combat training and torture methods. The opening half of the book details Gertz’s fluent deconstruction of some of the common philosophical positions around war and trauma. Just war theory, in particular the work of philosophers Michael Walzer and Jeff McMahan, comes in for withering criticism as the book systematically pulls apart and problematizes the just war presupposition of a ‘common morality’ (16) that we all live by. The deepest problem to this notion of the common morality is that it ensures the creation and enforcement of a rigid binary system – an “Us vs. them” mentality that does not just cover soldiers at war and their enemies, but is continued when these traumatised individuals return back home. Returning combatants are all too often told that their problems are down to an adaptive disorder – in essence, veterans of traumatic combat are treated as if their issues are based on an inability to grasp that the world they experienced at war, is no longer present. Rather, what is necessary is to get them to see the world as the rest of us do – to participate in the ‘comfortable world of moral agreement’ (17) that the just war theorist puts forward. It is this concern with a tendency towards empathic project that leads into the next section, where through careful analysis of the experiences of soldiers and the philosophers who have responded to them Gertz uncovers the complex relationship between identity as a combatant and responsibility for combatant actions. The judgementalism of just war theory must be replaced with the philosophical tools of existentialism and phenomenology (36) in order to gain a deeper appreciation of how combatants perceive themselves and what role responsibility really plays. All too often theorising and philosophising around inflammatory topics such as torture leads to a dangerous de-politicisation of the issue, allowing it to be shrunk into reductive abstraction that obscures the true context that such acts occur within. With that in mind, the book avoids this kind of abstraction by choosing instead to delve into empirical records of just how torturers are produced. Gruelling descriptions of the practises of the US military torture school (SERE) graphically illustrate the ‘processes of authorization…and routinization’ (76) by which the isolated subject is placed within a rigid command structure and through repetition and brutal dehumanization turned into someone capable of carrying out these kinds of acts. With the aid of memoir and reportage, Gertz neatly encapsulates the systemic nature of the issue with the acknowledgement that torture can turn a ‘victim into a perpetrator and a perpetrator into a victim.’(78) As with war, to moralise is insufficient but an understanding of the phenomenological and existential aspects to torture allow one to grasp how the dehumanisation of the subject can render them capable of inflicting similar dehumanisation onto others. The book culminates with Gertz’s conclusion as to the status or position of the combatant within society, summed up in his use of the term ‘exile.’ Drawing from the mockery of veterans who returned from Vietnam and the mockery that drone operators all too often face the returning combatant is posited as being exiled from a society that does not fully understand their experiences and furthermore, refuses to take the full measure of responsibility for them. By exiling the combatant into a wounded warrior whose experiences can be pathologised into a PTSD diagnosis the solider no longer provokes societal concern but rather ‘a parade.’ (149) By turning them into heroes who sacrifice so much we neatly elide the question of just what about the society we live in has made their sacrifices so necessary (149) A point not touched on by the book is the link between these affective insights and the role of capitalism. Increasingly military services are outsourced to for profit companies and thus people who are, ostensibly, mere civilians, end up providing military services. It would seem that an extension of Gertz’s analysis would force us to examine not just the exile of the solider, but rather the entfremdung of the worker more generally as big private military corporations and the military state become more and more closely involved. In the books conclusion the full philosophical scope of the painstakingly assembled argument becomes clear. The status of humanity is one that is profoundly disturbed – ‘humans are not at home in the world’ (152) and our treatment of the traumatised combatant is part of a wider strategy to avoid confronting this. Through his well-researched and fundamentally compassionate piece of philosophical thinking Gertz raises vitally important questions around not only our current military, but how we relate that military to every other aspect of our shared human life. The Philosophy of War and Exile then is a book with a scope and reach far beyond the realm of just war theory, political philosophy and modern politics. Rather, by questioning the common sense assumptions that undergird the military industrial complex that makes itself ever more felt Gertz has shown with clarity and great power the efficacy and necessity of philosophical intervention. In his quietly stylish first full length philosophical intervention, Gertz shows himself to be not just an astute philosopher of war but rather a philosopher capable of showing with considerable power how philosophy can lead us to not just think differently, but live differently too. At the books close we might be more aware of our own insecurities and more alert to the intricate phenomenological connections we share to the world and people around us. We may not end war through philosophy but to be better able to ‘reflect on experience and to convey experience’ (155) is the first necessary step towards no longer seeing those who fight as exiled from the rest of us.